As Arnold Schwarzenegger promised in the original Terminator slot machine stating ‘I’ll be back’ he certainly kept to his word - and he’s back in blockbuster fashion just like the movie sequel with the Terminator 2 slot machine which is available at all Microgaming-powered casinos. The movie sequel is titled Terminator 2: Judgement Day and sees Arnie don his leather jacket and motorcycle once again as he travels back in time to protect John Connor and his mum Sarah Connor from the advanced T-1000 Terminator who has morphing abilities and is determined to prevent John from becoming leader of the human resistance. Boasting sensational 3D graphics that see character symbols which are part of winning combinations transform into quick movie clips, the Terminator 2 slot machine also boasts a T-800 feature and a free spins mode for a truly action packed slot that will get your adrenaline pumping – as will the opportunity of winning up to 88,000 coins which is proudly highlighted when you load the slot. 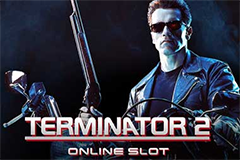 The Terminator 2 slot machine is played across 5 reels and uses the popular 243-ways Microgaming structure, usually reserved for their hottest titles, and there are a variety of betting options available to you no matter what level your bankroll is at. There are four different coin sizes of 1p, 2p, 5p and 10p, and the fact that between one and ten coins can be bet means you could play for as little as 30p a spin up to the maximum of £30 per spin. In true Terminator style the reel design is metallic and robot oriented, but it’s the character symbols that feature which really bring Terminator 2 to life as when they are part of winning combinations a cinematic scene from the official movie plays out, just as happens in The Dark Knight slot machine and many other movie-themed slots developed by Microgaming. The fire-laden ‘T2’ logo symbol is the Wild with the ability to replace all symbols apart from the Scatter and T-1000 symbols. The Scatter is the electric blue portal and this is required to trigger the free spins feature. Aside from these you’ll encounter Terminator, John Connor, T-1000, Sarah Connor, T-800 plus playing card suit symbols – a nice change from the normal Ace to 10 symbols. It’s actually the Scatter that has the highest value with five on a payline rewarding you with 100x your bet, while five of the T2 Wild symbols are worth 50x your bet. The standout feature of Terminator 2 is the free spins mode, triggered once you land three, four or five of the Scatter symbols in any position during the same spin – though it can also be triggered with the T-800 Vision feature too. The free spins are played across a 1,024-ways structure rather than the base game default of 243-ways thanks to the addition of an extra row with you receiving a total of 10 free spins, and before you ask – no they cannot be retriggered which is bitterly disappointing. Throughout these free spins T-1000 can transform into other characters in order to provide the highest possible win. Fans of the movie will be reminiscing when the randomly triggered T-800 Vision feature begins, but it can only be activated while playing the base game and not the free spins mode. This sees the reels overlay with red and you taking the view of Terminator himself as he scans the reels searching for targets. For each character symbol that is on the reels you’ll receive a cash prize with the T-1000 symbol bringing the largest reward of all and being the last symbol to be scanned if it is present. That’s not all though as if one or more Scatter symbols are present you’ll also trigger the free spins feature – more often than not from my experience! Hasta la vista is Spanish for ‘see you later’ and you’ll certainly see the Terminator 2 slot machine again as just a few spins will leave you hooked for more action at sites like 32Red Casino which boast the full Microgaming suite of games. Not only have Microgaming nailed it with the metallic design and the cinematic symbols, the official sounds from the movie and the fact the bonus features tie in to the storyline so well make it a fans dream to play. While the T-800 feature doesn’t bring the biggest wins, it does make it easy to activate the free spins mode and it’s where you’ll find the biggest wins of all in Terminator 2!